Six military officers that comprise the advance team of what is expected to be as many as 250 United Nations (UN) observers and ceasefire monitors arrived in Damascus and checked in to the Sheraton Hotel. They will enter into a series of meetings with the Syrians to work out how they will move around the country, what access they will have, where they will work, security arrangements for the team, etc. Having been assigned as the air attache at the U.S. Embassy in Damascus and having worked with the Syrian Ministry of Defense foreign liaison office - the office that will likely work with the UN officers - I can safely predict that the six officers are about to learn about Syrian bureaucracy. As with most dictatorships, the regime can get things done quickly when it wants, and can drag its feet interminably when it doesn't. I am putting support to the UN in the latter category. I suspect the officers are going to spend quite a bit of time at the Sheraton. If you have to cool your heels in downtown Damascus, though, it's as good a place as any. The Syrian regime is only allowing these officers into the country as part of an information campaign to allay criticism from the rest of the world. It hopes to prevent increased political pressure and possibly economic sanctions. Since the uprising began over a year ago, the government of President Bashar al-Asad has portrayed the opposition as "terrorists." The tech-savvy al-Asad has made effective use of the internet and social media organs like Facebook, YouTube and Twitter in an attempt to frame perceptions of the conflict in his favor. I have looked at the effort - it is quite professional. Allowing the UN to send observers is another tactic in that strategy. Even if the UN effort grows to 250 officers, they will never be able to effectively fully observe what is going on in the country. If past performance is any indication of the effectiveness of these type of UN missions, this one is doomed to failure and will be nothing more than a propaganda tool for the Syrian regime. The officers will never have the unimpeded access they need, and everything they see will be carefully orchestrated. The Syrians are very good at managing perceptions. For example, when President Bill Clinton visited Damascus for six hours in 1994 (when I was the attache), the Syrian government decided that the scenery on the road from the airport to the presidential palace included some eyesores, one of which was a refugee camp inhabited by Syrians who had been displaced from the Israeli-occupied Golan Heights. We watched in amazement as the residents were forcibly relocated to apartment blocks, and the entire refugee camp leveled by bulldozers and replaced with a beautifully landscaped soccer field - overnight. 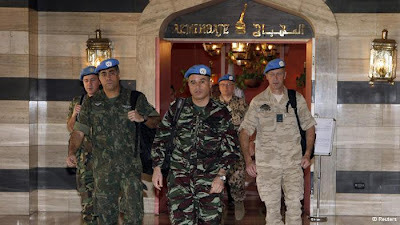 The United Nations Interim Force in Lebanon (UNIFIL) was established by the Security Council on 19 March 1978 through the adoption of resolution 425 (1978), to confirm Israel’s withdrawal from southern Lebanon, restore international peace and security and assist the Government of Lebanon in restoring its effective authority in the area. In addition to the adjustments of the mandate after the 1982 Israeli-Lebanese war and after the Israeli withdrawal from Lebanon to the Blue Line in 2000, its mandate was again expanded in August 2006 following the Israeli-Hizbullah war. Its tasks included monitoring the cessation of hostilities, accompanying and supporting the Lebanese armed forces as they deployed throughout the south of Lebanon, and extending its assistance to help ensure humanitarian access to civilian populations and the voluntary and safe return of displaced persons. The United Nations Disengagement Observer Force (UNDOF) was established by the Security Council on 31 May 1974 through the adoption of resolution 350 (1974), following the 1967 Arab-Israeli War and the subsequent agreed disengagement of the Israeli and Syrian forces in the Golan Heights. Since then, UNDOF has remained in the area to maintain the ceasefire between Israel and Syrian Arab Republic and to supervise the implementation of the disengagement agreement. The fact that both groups still exist is an indication that they don't solve problems, they only acknowledge their existence. UN observer groups are big business in Syria, Israel and Lebanon. There is a difference with UNIFIL and UNDOF as far as the Syrians are concerned. For the Syrians, it is a tool to be used against the Israelis. The newly formed observer group in Syria is actually aimed at the Syrians, so don't expect much cooperation. To the contrary, you can expect obstruction - it will be subtle, but it will be there. The observers are there to monitor a ceasefire negotiated by former UN Secretary General Kofi Annan. For whatever reason, the UN is now invested in the Annan plan, a six-point plan that has almost no chance of succeeding. Anyone who has lived in Syria since the 1970 "Correctionist Movement" of Bashar's father Hafiz al-Asad knows that the government cannot share power - they must retain their positions through coercion and force. That necessitates the presence of Syrian troops in the cities where the uprising is strongest - Homs, Hamad, Idlib, Dara' and others. Of course, these cities are where the observers will demand to go - I would do the same. Just as with the now-defunct Arab League observer mission earlier this year, they will never quite be there to see anything that shows the government to be in violation. When the observers are allowed to visit, there will be no troops visible. When the observers depart, the troops will return. This is their country - they know it better than the observers. The cities are hours apart over mediocre roads - the UN officers will spend hours in vehicles only to arrive when things have been properly staged. I feel for the military officers on the observer team. They are likely professional officers trying to carry out an near-impossible mission, but will be frustrated at every turn. I know - I have walked in their boots. Allowing the UN monitors into Syria is a calculated move by the al-Asad regime. They hope to be able to manipulate the officers to prevent them from seeing anything that would give the UN an excuse to levy sanctions on the Syrian government. I hope the Syrians are not successful, but I expect they will be. Obama, Peres and Pollard - any "flexibility?"